Desma Thomas-Bateast didn't have to travel far from home to become a Hurricanes star, having attended American High School in Hialeah. Once she got to Coral Gables, she became one of UM Sports Hall of Fame member Coach Fern Labati's go-to players. A four year letter winner, Desma is the Hurricanes all time leader in 3 point baskets made and attempted. She scored 1,284 points in her career, 11th all time at UM. 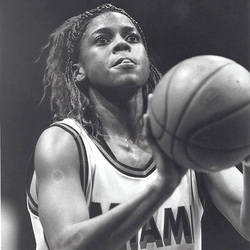 A two-time All BIG EAST third team selection, (93-94, 96-97) she was a part of the Canes back-to-back BIG EAST Conference regular season and tournament titles in 1992-93 and 1993-94. She was also named to the 1997 BIG EAST All Tournament team. She also holds the school single game records for free throws made (18) and attempted (22) in a game. Desma also served as a community spokesperson for the athletic department's "Join A Team, Not A Gang" program. Desma feels she was privilaged to play at Miami with other UMSHoF members Vicki Plowden, Jeannie Hebert-Truax and Octavia Blue. After graduating from Miami, Desma set out to play professionally, first with the Phoenix Mercury of the WNBA in 1997, then she saw stops in Italy, Sweden and Turkey, before joining the Birmingham Power of the NWBL in 2002. Desma graduated the university with a Bachelor of Business Administration, specializing in Sports Management. She is married to Wil Bateast, Jr. and they have a daughter, Kayla Lee. She is currently an assistant women's basketball coach and recruiting coordinator at Florida International (FIU).